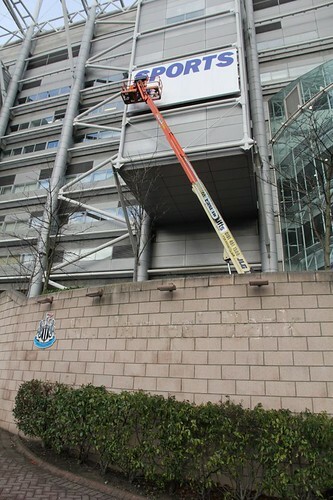 The signs saying 'St James' Park' at Newcastle United's home ground have been taken down - and replaced with 'Sports Direct Arena' ones. Newcastle's ground has been known as St James' Park for 120 years, but back in November, club chairman Mike Ashley announced the name change to showcase 'potential sponsorship opportunities'. At the time, Managing director Derek Llambias said: "Stadium rebranding offers a lucrative way for clubs to secure significant additional income." Following the announcement of the name change Newcastle City Council wrote to the media earlier this year to ask them not to embrace the new name of the stadium. "The motion requests that the city council write to the media and asks that they continue to use the name of St James' Park in all reporting and refuse to use the name Sports Direct Arena. We respectfully request that you take this approach. "For its part, the city council has taken the decision not to change any wayfinding signs which bear the name St James' Park, and calls on the club to reconsider their decision. "We would ask that you acknowledge the strength of opposition among Newcastle fans against changing the name of the stadium and continue to call it St James' Park in all reporting." The stadium's being used for 2012 Olympic Football in the summer - and will be known as St. James' Park for the event because of sponsorship rules.